Book of Five Rings is Classic! In the famous martial arts work, the Book of Five Rings, there are five elements. These five elements, earth, water, fire, air and void, are concepts that can destroy or generate each other. It is believed that understanding these five elements is key to understanding war on a grand, or on a personal, level. The first thing to be understood is the arrangement of the five elements. While Miyamoto Musashi has presented his arrangement, it is based on his samurai experiences, and thus misses a more fundamental picture. Or, perhaps we should just say that there is the strategic arrangement, and then there is the philosophical arrangement, such as I present here. In researching this matter, and in applying Matrix theory, there is a more wholistic, perhaps Chinese, approach to the five elements. This is a matter of defining the value of the elements from the point of view of their source. In accomplishing this one finds that physics, not mysticism, is at the core of the matter. The first element to be considered, in the proper arrangement of elements, is air. Air is breathing, air is life. Ultimately, air permeates our being and gives rise to further development of elements. The second element in this arrangement is fire. Air feeds fire, and thus, if one breaths ‘to the Tan Tien,’ one is generating the fire that one needs to be a grand warrior. It is fire that is utilized in combat, and must be enhanced, tamed and aimed, all at the same time. The third element to be considered in this re-arranging of elements is earth. A warrior breathes, and he creates fire, and he controls the fire so that it charges down the limbs and into the very ground he stands upon. A warrior who can hold his position, no matter the attack, is a superior warrior indeed. The fourth element to be considered is water. When a warrior is attacked, even by superior forces, he learns how to give way, preserve himself, and wash back over the attacker. This element indicates the beginning of a fundamental transition from youth to wisdom, and, in the martial arts context, to a more ‘liquid’ approach to living, and a fundamental awareness of how the five elements interact. The fifth element is void, and it has been considered quite mystical and unexplainable, and yet the lynch pin of one’s personal growth. When one considers that in the absence of elements spirit can grow, and that spirit is awareness, the mystery is solved. Ultimately, it is awareness that rules the other elements, and awareness that determines the successful outcome of conflict, be it on a personal, or a grand, level. 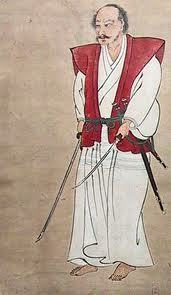 And it is awareness that is at the culmination of martial arts studies, such as described by the Book of Five Rings.